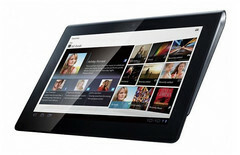 For a higher than suggested retail price, be one of the first to get the Sony tablet in the U.S. While the Sony Tablet S is still only available as a pre-order item in the U.S. through the online Sony Store, at least one retailer is already shipping the device out to customers. 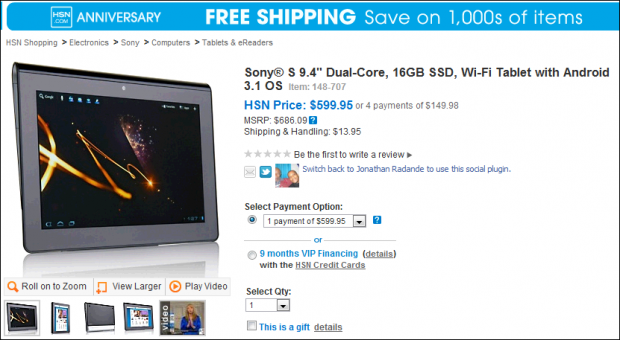 The Home Shopping Network (HSN) is now offering and shipping the 16GB Sony Tablet S, although users will have to pay to a premium if they want to get it before everyone else can. HSN has bumped the retail price up from $499 to $599 plus shipping and handling, although monthly payment options are available as well. The 9.4-inch Android tablet is expected to launch before the end of this month, but if the HSN is any indication, the Sony tablet may be available through Sony’s official online store sooner rather than later. As for the Sony Tablet P, the dual-screen clamshell tablet is still unavailable for pre-order through the U.S. online Sony store as of this writing and should be launching sometime after the Tablet S.